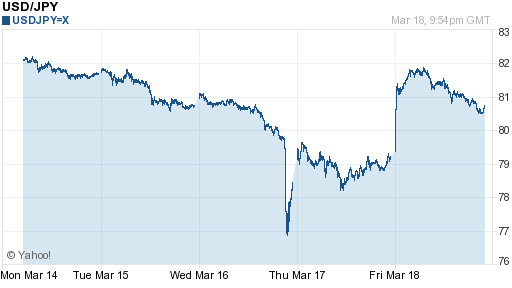 The last week has witnessed unprecedented volatility in the Japanese Yen. Following the earthquake/tsunami and the inception of a nuclear crisis, the Yen defied all logic (and embarrassingly, my own predictions…mea culpa) by rising to a post-World War II high of 76.36 against the Dollar. Then, as rumors of Central Bank intervention began to circulate, it suddenly shot downwards, before resuming a steady upward path. Who knows what next week will bring?! It’s unclear exactly what’s driving the Yen. Personally, it seems a no-brainer that the string of natural disasters that ravaged Japan would have caused an outflow of foreign capital and a drop in demand (due to a lack of supply) for Japanese imports. In reality, investors began to fear a wholesale selling of Japanese-owned foreign securities widespread repatriation of Japanese Yen by insurance companies and other financial institutions, in order to raise funds for rebuilding and the payout of insurance claims. While there is still no evidence that such has actually taken place (in fact, the Japanese stock market collapsed as expected, and overseas markets experienced only modest declines), speculators feared the worse, and moved to unload all of their Yen short positions. As hedge funds and domestic Japanese investors tried to exit their Yen carry trades, it caused the market to panic, and the Dollar to fall off a cliff against the Yen, rising 3% in a matter of minutes! As if it wasn’t immediately obvious, “Asset managers, hedge funds, corporates and private clients were all net buyers of the yen for the first time since October,” which means that what we’re basically witnessing is really just a massive short squeeze. The Yen has since resumed its appreciation, which has a few implications. First of all, it shows that speculators are still nervous about carry trades that are funded by Yen and continue to think of Japan as a safe haven. This is especially true of domestic Japanese investors, who are naturally bound to become more conservative in the wake of the recent natural disasters. No one knows for certain the size of the Yen carry trade, but 2010 estimates pegged it around $1 Trillion. 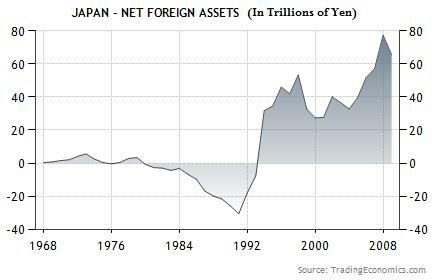 (Japanese investors purchased $1.25 Trillion in foreign assets between 2005 and 2010 alone!) If that’s the case, there is still quite a bit more unwinding that can be done. In addition, given that Japan is the world’s largest net creditor [the Bank of Japan owns $900 Billion in US Treasury securities, while Japanese sovereign debt is 95% owned by domestic investors], the phenomenon of risk-aversion would be net positive for the Yen. Second, it shows that investors are skeptical that the Yen’s appreciation can be contained. And if market forces are determined to push the Yen upwards, they are probably right. Simply, the G7 Central Banks (not including Japan) have very limited Yen holdings, which means there is only so much Yen they can sell. On the flipside, the Bank of Japan has potentially an unlimited supply of Yen at its disposal. In fact, the BOJ already expanded its money printing / quantitative easing program, by “doubling planned purchases of exchange-traded funds, real estate investment trusts, corporate debt, and Japanese government bonds to 10 trillion yen, and launching a program to supply financial institutions with 30 trillion yen in three- and six-month loans at 0.1 percent interest.” This is on top of the 28 trillion yen ($346 billion) that is had already injected into the financial system. While perennial deflation has afforded the BOJ a wide scope, it must still tread cautiously, lest it add inflation (and stagflation) to the country’s list of problems. 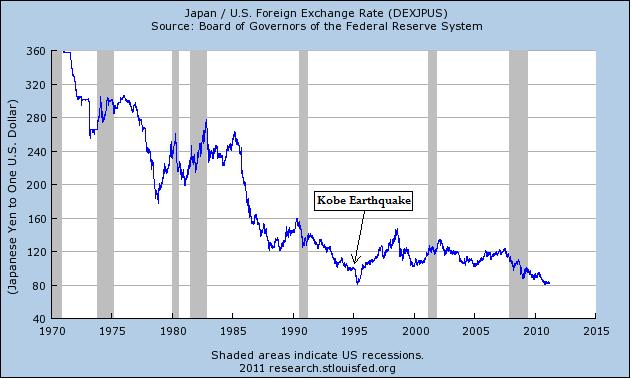 Some analyst point to the Kobe earthquake of 1995 as a basis for Yen bullishness. After a one-month lull, the Yen dramatically surged upward, rising 20% in only two months. That disaster also took place towards the end of the Japanese fiscal year (March 31), and seems to suggest that a proportionate Yen rise should take place this time, too. On the other hand, the Yen proceeded to drop 50% in the two years following the Kobe earthquake, showing the extent to which investors had gotten ahead of themselves. In other words, while there might be significant repatriation of Yen in the short-term, this will more than be outweighed by the decline in GDP, collapse in production/exports, and destruction of stock market value over the long-term. Until the nuclear crisis is resolved and estimates of the cost (currently pegged at $100-200 Billion) of reconstruction are finalized, the markets will remain jittery. And we all know that volatility will not help the Yen carry trade. Given the BOJ’s determination to hold down the Yen, and the fact that this crisis will only exacerbate Japan’s fiscal issues and its unending economic decline, I’m personally still long-term bearish on the Yen. Great article on the yens. It is always puzzling when the yen move is not attributed to risk sentiment. With all the volatility coming due to uncertainty, the next few trading weeks should be interesting. My comment here regards mostly the USDJPY rebounce. G7 or no G7, it looks to me as if large option writers simply couldn’t afford to cover all the puts and have therefore forced the USDJPY up prior to option expiration (remember that it all happened within a single week). PS. I believe that in short/mid term, USDJPY may go fill the 500+ pip weekly shadow and once the fear of and/or effective repatriation of funds will have become past, JPY will begin its long journey down against most if not all majors. Pardon me, I meant all the JPY calls in the comment above (wrote puts instead having USDJPY in mind).